Maybe you're Nicolas Cage in Leaving Las Vegas and the happy-roller-coaster-fake-New-York-acrobat-show Vegas isn't quite right for your alcoholic suicidal mood. Or maybe you lack the depth, but want to write moody punk songs anyway. That's when you go downtown to the tiny, old part of Las Vegas that is technically the only part of the city where Mayor Oscar Goodman has jurisdiction. It's seedy and ugly and makes you feel like an outlaw. I've played poker at Binions  home of the World Series of Poker  at a table where everyone but me looked like one of those old men under the ghost masks on Scooby Doo. 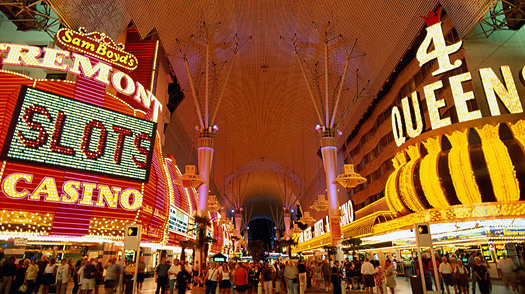 The city's first step in sprucing up downtown is the the sort-of-cool, sort-of-depressing Fremont Street Experience, where parents bring their kids to watch the outdoor mall's ceiling tell little vignettes in laser lights, like a Western Stone Mountain. Then they give blood for slot machine money.